Authorities in Hubei province have submitted an application to UNESCO nominating China's Duanwu (Dragon Boat) Festival for the "Intangible Culture Heritage" tag. Four years ago, the Republic of Korea's (ROK) Ganjeung Danojie (Duanwu) festival made the prestigious UNESCO list of intangible heritages, which sparked a heated debate, with China claiming and the ROK acknowledging that the festival originated in the Chinese mainland. The Dragon Boat Festival falls today this year. 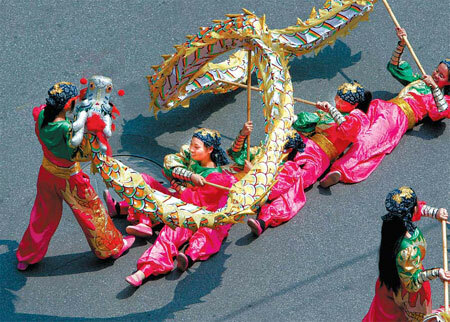 In its 2005 application to UNESCO, the ROK wrote: "(The) Duanwu Festival, which originated in China, has been celebrated by Korean people for over 1,500 years." "There is no reason for confusion or conflict," said Jiang Qinghe, director of Intangible Culture Heritage Protection Center of Hubei province. "The ways of celebrating the festival in China and the ROK are completely different." Citing an example, Jiang said the Azerbaijani Mugham, the Uyghur Muqam of Xinjiang of China, and Iraqi Maqam, which are the "same kind of folk song with the same origin", have all been designated as Intangible Cultural Heritage. China's application of Duanwu Festival comprises four parts - the Duanwu customs of Qu Yuan's hometown in Zigui county of Hubei province, boat race of Huangshi city in Hubei, Miluo riverbank customs in Hunan province, and customs in Suzhou of Jiangsu province, Jiang said. "The Ministry of Culture chose the four components, which best represent the Duanwu tradition in China, and are completely different from the Gangneung Danojie Festival, which has a lot of Korean features," he said. Of the Gangneung Danojie Festival, UNESCO's list description says: "It includes a shamanistic ritual on the Daegwallyeong Ridge to pay tribute to the mountain deity and male and female tutelary deities. It encompasses traditional music, folk song and poetry." In China, however, the Duanwu Festival is more or less limited to eating Zongzi (rice dumplings), drinking wine, racing dragon boats and remembering Qu Yuan, an ancient Chinese poet and minister, whose suicide was widely believed to be the origin of the Dragon Boat Festival. Jiang said if China's Duanwu Festival is added to the UNESCO list, it could influence more generations to come. He admitted that the Chinese should feel pressured, as there's still a "lot left to do to protect and promote" the tradition. 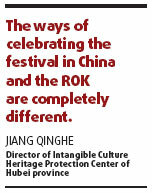 "It is understandable that the Chinese feel confused that the ROK made China's festival into its intangible heritage," Jiang said, adding that China should take a lesson from other countries that are trying to preserve their culture. Currently, China's Qunqu Opera, The Guqin and its Music, The Uyghur Muqam of Xinjiang, and Urtiin Duu-Traditional Folk Long Song figure in UNESCO's list of intangible cultural heritages.